I’m looking forward to a very deep dive–not another “Digital Signage 101”–into the most compelling digital signage trends and technologies that are transforming educational and corporate campuses today. 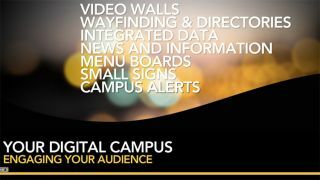 I encourage you to join the interactive discussion tomorrow, Thursday March 2nd, 2pm EST, for the free webinar “Your Digital Campus: Five ways digital signage leaves a lasting impression”. To register, click here.The webinar, moderated by myself, David Keene, Executive Editor, NewBay Media, will feature one of the country’s top experts, Eric Henry, President, Tightrope Media Systems, who will share his deep knowledge of what AV integrators and digital signage end users are looking for, and what’s he’s seeing evolving– trends, and best practices, and clarification on the functionality and performance of digital signage content management software platforms. And, most important of all: we’ll look at how you differentiate among digital signage content management software platforms, when so many providers of the different platforms claim they “do it all”.